Ctra. Salamanca A Zamora Km 1,5, 37184 Salamanca, Spanje. This modern hotel offers comfortable accommodation at great rates in a quiet, peaceful location with great access to the region's major road network. The hotel is conveniently located just off the N-620, one of the main routes into the city. 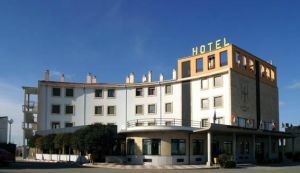 Its proximity to the area's major roads makes the Hotel Helmántico a great base for visiting the city on business or for exploring Salamanca and the surrounding region for leisure. 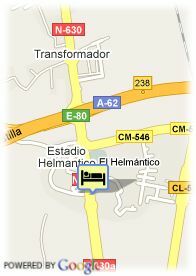 The hotel is located right in front of the city's Estadio El Helmántico football stadium and the very centre of Salamanca is just a short distance away. The hotel has 50 double rooms and 5 single rooms. All of the hotel's accommodation is well-equipped, with all the modern comforts and facilities you need in a restful, relaxing base. Visa, Maestro, Mastercard, American Express, Carte Bleue, Red 6000.